Rumor has it that my girl, B, will finally cut one of her two men in waiting loose in tomorrow's season five finale of Gossip Girl. Emotions are already running rampant for us Hardin House girls as the year draws to a close, so the fact that one of the most epic love stories in television history's fate is about to be determined is in no way helping tame these wild emotions. The two gentlemen vying for Blair's affection come from opposite sides of the tracks; we've got Chuck, the first love bad boy Bass billionaire versus Dan, newcomer Brooklynite brainiac. For those of you who dared to Dair, I have no choice but to question your sanity. I'll forever be loyal to Chuck and Blair. We've dealt with one too many intruders with the likes of the Prince of Monaco whose failure to deliver the fairy tale Blair dreamed of made their relationship more of a tragedy than anything and now Humpty Dumpty Lonely Boy is making his futile attempt to step in line. The inevitable truth is that nobody will ever come close to competing with the Dark Knight. He's the Ross to her Rachel, the Pacey to her Joey, the Seth to her Summer. The two were destined to rule the island of Manhattan with the Empire Hotel serving as their throne and Dorota as their page. It's been five very, very long seasons in the making and photos make it appear as though we will be viewing a Casablana-esque reuniting for the two, totally appropriate for Miss Waldorf and her penchant for old cinema classics. Only time will tell the fate for Blair with there being devoted fans on every end of this triangle, and surprise twists are anything but foreign to this series. 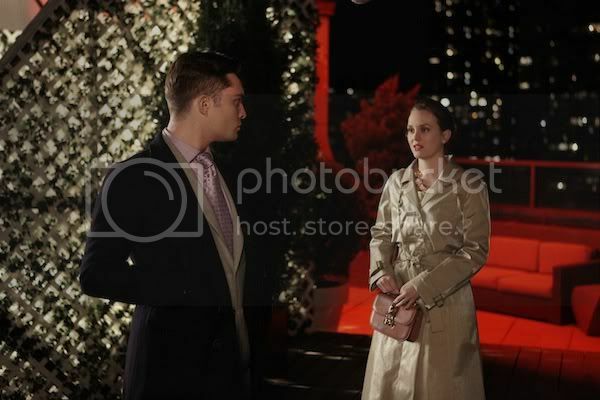 So, hopefully tomorrow's reasons to celebrate will be two-fold for me: to celebrate the conclusion of both my finals and the culmination of Chuck & Blair's story.